Rice farmers in Kisumu county, Kenya, receive training from 2SCALE-linked organizations. The capacity building program is led by two private firms: Cool Trends, which specializes in farmer training and business support, and Nyabon Enterprises, which supplies farm inputs and equipment. Three model farms have been established, allowing farmers to learn by doing. One model farm is managed by Nyabon, the other two by farmer groups. On each model farm, field days are held at critical crop stages such as nursery establishment, transplanting, and harvest. Nine field days were organized in the 2018 season, attracting more than 2500 visitors (1200 of whom were women). Field days were highly interactive, with farmers sharing ideas with each other, with project trainers and coaches, and with extension officers from the county government, the National Irrigation Board and the Lake Basin Development Company. Nyabon Enterprises makes various technologies available for rental by farmers. Videos proved to be a particularly effective training tool. Short videos on production techniques were followed by discussions, guided by trained facilitators, that dug deeper into technical aspects as well as costs and logistics. Eight video shows were organized in July, attracting more than 1100 farmers (360 of whom were women). Why July? Because of the football World Cup; training videos were screened at popular venues, just before big games! These programs have contributed to a massive increase in rice production. 2SCALE farmers have increased yields by 30%. They are getting better prices because they have larger volumes, better quality, and sell collectively. 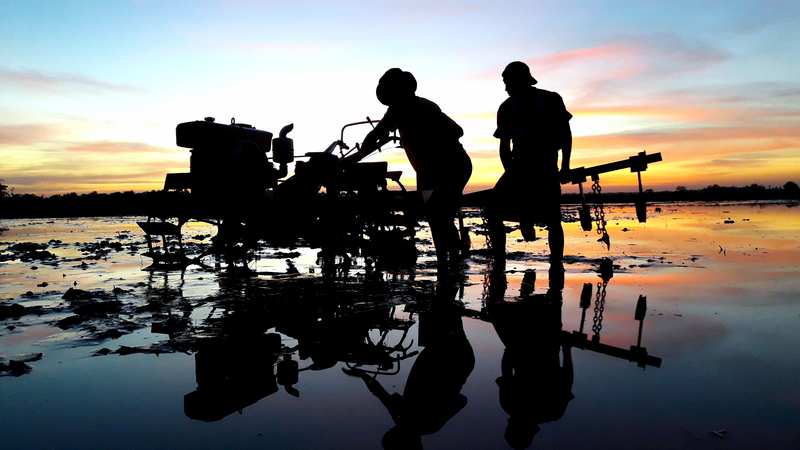 This season, farmers from neighboring communities are planting rice for the first time. Annex plots – farmers’ fields next to model farms, where they replicate the technologies demonstrated – have increased by 160%. 2SCALE farmers have increased yields by 30%.